There are some traditional summer treats that are too good not to explore. 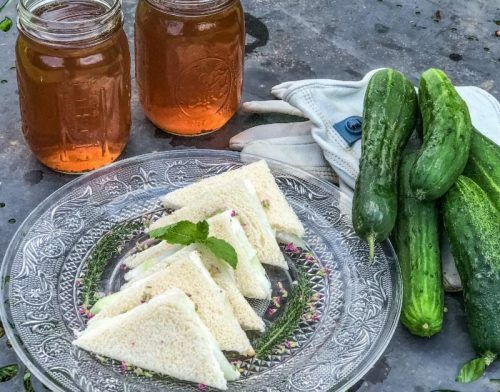 Cucumber tea sandwiches paired with a refreshing glass of iced tea is one of these. This conceptually simple recipe requires the freshest of ingredients and a couple tricks to create the delectable treat you would expect to find at the finest of English teas. This modernized recipe substitutes softened whipped cream cheese for the hand churned butter that was historically used. Nothing from a supermarket can provide the rich creaminess of butter just off the farm. Fortunately, you can still get fresh cucumbers from your garden or the local farmers market. Removing the skins and seeds, thinly sliced on a mandolin, and salting creates the perfect cucumber bite. Remove the skins from the cucumbers with a peeler. Slice cucumbers in half lengthwise and gently scrape seeds out. Cut cucumbers thinly on a mandolin or with a knife. Place cucumber slices on a plate and sprinkle with salt. Let them rest in a cool place for 15 minutes while the salt flavors the slices and removes excess water. While you are waiting on the cucumbers, you can gently roll the slices of homemade bread with a rolling pin so they will not be too thick. Lay out 20 bread slices in a row. Spread each slice with a thin layer of whipped cream cheese. Place the second slice of bread over the cucumber slices. Cut the crusts off with a sharp knife, and then cut the sandwiches in half in a triangle shape. Enjoy!